Is There Marriage in the Afterlife? “Until death do us part” is a pledge in marriage liturgy, but there have been many messages from the spirit world suggesting that such is not always the case. That is, love bonds often continue after death. “If [marriages in the physical realm] are based in selfishness, they necessarily terminate sooner or later; but if true and well fitted, the spiritual dominating when on Earth, they continue on in our world of spirits,” one spirit communicator is quoted by Miles Edward Allen in his latest book, Astral Intimacy. “If a husband has had several wives, or a wife several husbands, the tie endures only between the most congenial pair,” another spirit communicator is quoted. “Until death us do us part” is a pledge in marriage liturgy, but there have been many messages from the spirit world suggesting that such is not always the case. That is, love bonds often continue after death. Allen has drawn from 50 different sources, many of them well-known researchers, such as Alan Kardec, William Stainton Moses, Sir Oliver Lodge, John Edmonds, and William T. Stead, among the older ones, and Neal Donald Walsch, Martha Barham, Ruth Taylor, and Michael Newton among the more recent. I am unaware of any other collection of quotes as comprehensive as this one. Allen prefaces the encyclopedia part of this book with some discussion of the sources and the phenomena giving rise to them. This should be a valuable travel guide for anyone expecting to take the ultimate journey. His latest book Dead Men Talking: Afterlife Communication from World War I is published by White Crow Books. Was Eusapia Palladino Fact or Fiction? 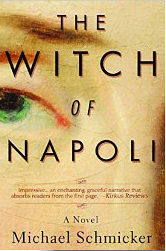 As Michael Schmicker, the author of the recently-released The Witch of Napoli, states, his book is a work of fiction. 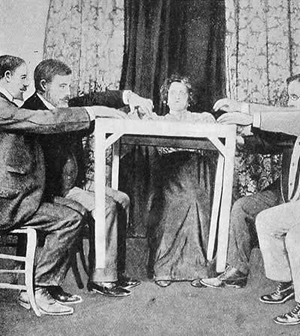 However, its inspiration was the true-life story of Eusapia Palladino (1854 – 1918), an illiterate Italian peasant who awed many people with mediumistic phenomena, including levitations, materialized hands and arms, occasionally a full form materialization, mysterious lights, the playing of musical instruments by invisible hands, and apports (objects materialized in the room), as well as communicating raps and voices. According to a number of Internet references, Palladino (also spelled “Paladino”) was nothing more than a charlatan, a fake, an impostor – someone pretending to have mediumistic abilities by using sleight of hand (and foot) trickery. But most of the modern references are written by debunkers and other “know-nothings” whose minds are made up in opposition to any psychic phenomena. They focus on the negative reports only while ignoring the positive reports and failing to consider explanations that have eluded mainstream science. As reported in the November 1909 Proceedings of the Society for Psychical Research, a series of 40 sittings were conducted by Dr. Julian Ochorowicz, a psychologist, in Warsaw, Poland, during 1893-1894. In all, 23 experimenters participated. In the end, 10, including Ochorowicz, were convinced of the supernormal character of the phenomena, while seven were uncertain but accepted that they could not have been due to ordinary mechanical agency. Thus, 17 of the 23 did not believe what they had witnessed was trickery. Two were inclined, with certain reservations, to deny the supernormal character of the manifestations, and three concluded it had to be fraud of some kind, even though they couldn’t prove it. One refused to express any opinion. And so it was with nearly every study of Palladino – some convinced she was a genuine medium, some convinced she was a fraud, and some not knowing what to believe. Schmicker, the author of Best Evidence and co-author of The Gift, has studied the many books and research reports on Eusapia (most researchers referred to her by her first name) and has concluded that she was a genuine medium who probably, when her powers failed her, as they often did, resorted to some trickery so as not to disappoint people in attendance. Since the scientific research reports about Eusapia make for some pretty dry and monotonous reading, not telling much about her personal life, Schmicker has tried to fill in the gaps by adding some speculative glamour and glitter. He combines fact with fiction but holds fairly tightly to the investigative and phenomenal aspects of Eusapia’s story. Dr. Charles Richet, a professor of medicine and physiology at the University of Paris and the 1913 Nobel Prize winner in medicine, agreed. “Even if there were no other medium than Eusapia in the world, her manifestations would suffice to establish scientifically the reality of telekinesis and ectoplasmic forms,” he wrote, noting that he observed her on some 200 occasions. The debunkers claimed that Morselli, Richet, and the many other scientific men who attested to the reality of Eusapia’s phenomena were simply duped by a clever magician. But two researchers schooled in both science and magic, Hereward Carrington and W.W. Baggally, along with Everard Fielding, closely studied Eusapia in Naples during 1908, attending 11 séances with her. “I have to record my absolute conviction of the reality of at least some of the phenomena,” Carrington concluded, “and the conviction amounting in my own mind to complete certainty, that the results witnessed by us were not due to fraud or trickery on the part of Eusapia.” Baggally agreed, pointing out that they observed 470 phenomena during the 11 sittings and that it was impossible for Eusapia to have practiced trickery constantly during the many hours they observed her.” Fielding supported the conclusions of his fellow researchers. Dr. Cesare Lombroso (called “Camillo Lombardi” by Schmicker), a pioneer in abnormal psychology and criminology, initially scoffed at the whole idea that there was anything to mediumship. Like the vast majority of naturalists, he believed that Eusapia, or Alessandra, as Schmicker names her, was suffering from something called female hysteria and that the various phenomena were produced by trickery. “Ladies and gentlemen, we have a choice,” Schmicker quotes Lombardi, “we can remain in the darkness of primitive superstition, or we can embrace the light of Science. I choose Science.” The supposedly “intelligent” world applauded Lombardi’s words. But after Lombroso began studying Eusapia, his attitude also changed. On two occasions he observed her being levitated above the table. Eusapia, who was seated near one end of the table, was lifted up in her chair bodily, amid groans and lamentations on her part, and placed (still seated) on the table, then returned to the same position as before,” he documented. In one of those levitations, Lombroso was holding one of her hands, as Professor Richet held the other. While in trance, Eusapia complained of (invisible) hands grasping her under the arms. Then, her voice changed, apparently to that of John King, her spirit control, and said, “Now I lift my medium up on the table.” Lombroso and Richet continued to hold her hands as Eusapia and the chair rose to the top of the table without hitting anything.” They then observed her deposited back on the floor with the same security and precision. Some of the séances observed by Lombroso were given during daylight conditions, but because of the sensitivity of ectoplasm to light, the best phenomena were produced under dark conditions with a red lantern permitting the sitters to observe. Richet described Eusapia as a simple-minded woman, yet intelligent. At his private retreat on Ribaud Island in the Mediterranean, Richet, along with Sir Oliver Lodge, a distinguished physicist and pioneer in electricity, Frederic Myers, an esteemed pioneering psychical researcher, and Dr. Ochorowicz, conducted experiments with Eusapia during 1894 and observed various phenomena. One of the tests they put her to involved a spring dynamometer, which, when squeezed, measured hand grip strength. It was Richet’s idea that all the energy used at a sitting had to come from the medium or some of the sitters. Thus, he recorded the grip strength of Eusapia and each sitter before and after the two-hour sitting. In the before reading, Lodge, who stood 6-4 with a muscular build, scored the highest, followed by Richet, Myers, and Ochorowicz, with Eusapia’s being much weaker than the four men. But after the sitting, Eusapia was giving a feeble clutch when she suddenly shouted, “Oh, John, you’re hurting me!” and the men observed the needle go far beyond what any of them could exert. Though Eusapia was searched before she came into the room and was not allowed in the room beforehand, there were times when the three men thought they saw her cheating by using her hands or feet. “She wanted us to understand that it was not conscious deception, but that [John King] took whatever means available, and if he found an easy way of doing things, thus would it be done,” Lodge explained. In other words, Eusapia’s consciousness had vacated her body and the invisible John King was controlling her arms and legs to accomplish certain tasks, thus making it appear that Eusapia was doing them consciously. At other times, a third arm – one made of ectoplasm, that mysterious substance exuded by some mediums – appeared and seemed to be extending from Eusapia’s body as if it were her own arm. Lodge added that Eusapia resented the charges of fraud and that he was willing to give her the benefit of the doubt, so far as the morals of deception were concerned, referring to her as a kindly soul with many of the instincts of a peasant. He recalled that on more than one occasion, she took a boat to a mainland village and came back without her coat. When asked what happened to it, she explained that she gave it to a beggar who needed it more than she did. While Schmicker adds glamour, gleam, and glitter to an already colorful, sometimes gaudy, tale – one that likely will exceed the boggle threshold of those mired in the debunking camp – he creatively captures the crux of the story as documented by various researchers and historians, offering the reader not totally familiar with story of Eusapia Palladino much to ponder on.